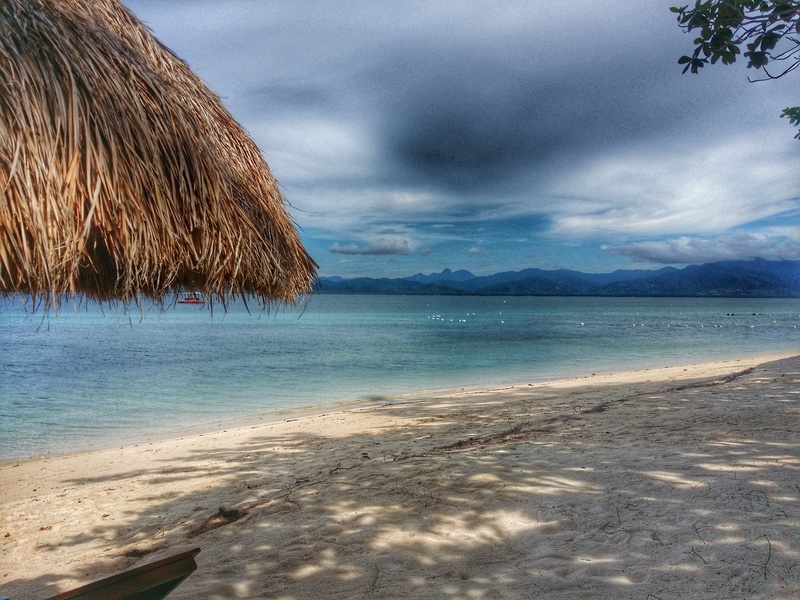 Having been cited and voted as one of the best islands-not only in the Philippines but in the whole world-, I think of Palawan as a place where I can just really relax on my chair, sip mango juice, and stare at the beach all day long. My idea of my first time in this place is to just lounge and see the Underground River (UR) just because it’s now one of the New Seven Wonders of Nature. I reserved 5 days (almost) and 4 nights here and it is intentional that I didn’t jam-packed it with lots of activities. Nevertheless, we still saw and experienced a lot. We got the tickets from a Cebu Pacific sale – Manila to Puerto Princesa International Airport for two pax, two-way trip was just at Php2,300! Good news: We boarded the plane from NAIA Terminal 3 on time. Bad news: the plane did not take off until around 50 minutes after. Cause: traffic on the runway. Ate Roxanne, our contact from a travel agency referred to me by a friend, welcomed us from Puerto Princesa airport. His husband, Kuya Dong, is a tricycle driver. They assisted us to the first hotel we stayed in – Alta City Pension. It’s a modest hotel from the inside of a narrow street in Rizal Ave. The rate is at Php950 per night for double occupancy plus Php100/person for breakfast with a choice of their available –silog (fried viand-rice-egg) meals. This hotel has basic amenities like hot/cold shower, air-con and cable tv. 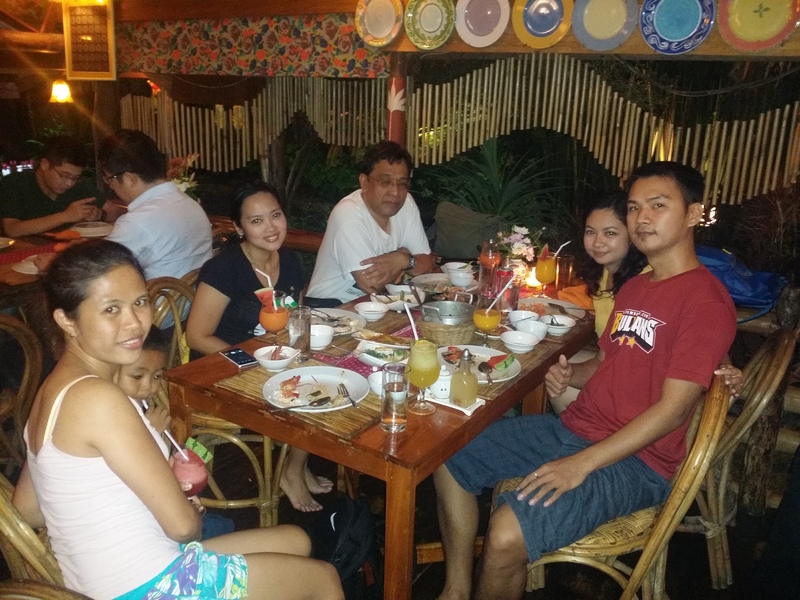 For dinner on our first night in Palawan, we aimed one of the more popular restaurants. 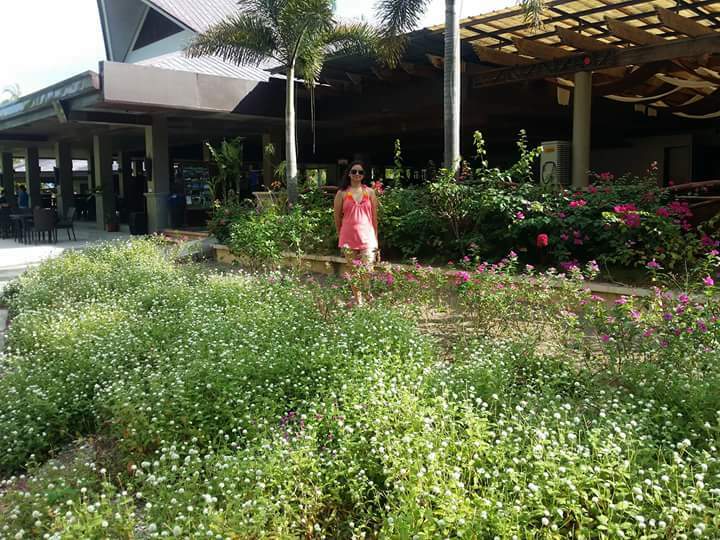 Puerto Princesa is a small city so almost all hotels and restaurants are near the airport and each other. First choice was KaLui, the top restaurant here, according to Ate Roxanne. Unfortunately, reservation is needed prior so we can not be accommodated there that same night. Our next choice where we ended up having dinner was Kinabuchs Grill and Bar. Food was great and affordable. Around 7:30AM, Ate Roxanne already knocked on our door to pick us up for the UR trip. Permits had to be pre-arranged to be able to join the trip and Ate Roxanne did this already for us.This UR tour is going to take the whole day as we were advised before. We brought spare clothes in case we got wet or had the chance to go swimming. But no, there are no swimming chances involved with the UR tour. The van bears a banner of Palawan government for tourism. 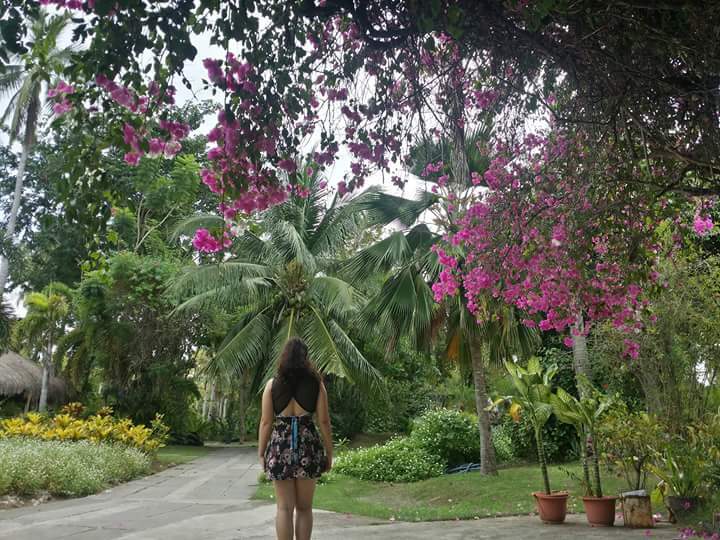 The package which included the van ride, buffet lunch near the beach, boat transfer to the island (where St. Paul, the mountain that houses the UR, is located) costs Php1,400 per person. Sixty pesos environmental fee is excluded. What I like about this city is that tourism rates are set to standards. It may just deviate a little depending on your bargaining capacity. A total of eleven tourists are in our van, composed of some Swiss and German nationals and of course, Filipinos. All of us were fetched by the van from our different hotels. Traveling is an opportunity to meet and talk to other people and here inside the van, we made new friends with other four cheery and good-natured Filipinos. The tour guide was funny. He spent the first hour of the two hours van ride giving some historical facts and background of the UR, injecting jokes while at it. What we didn’t know is that there is a side trip before heading to UR. 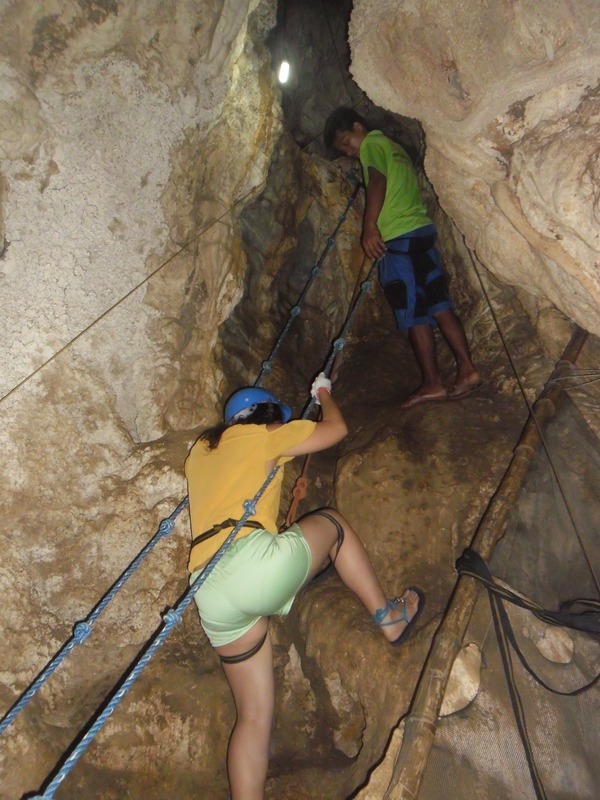 The side trip to UR is Ugong Rock Cave where activities are spelunking and zip line. Patrick and I tried both. 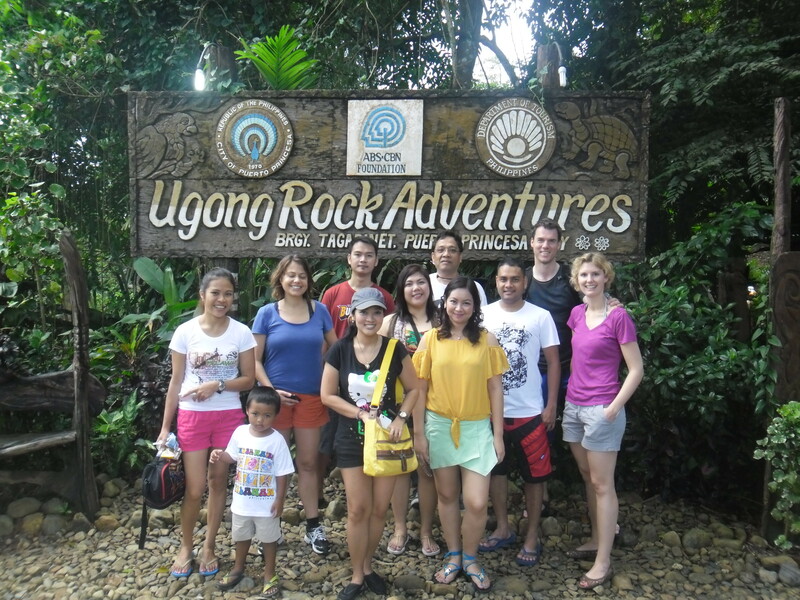 Later at night, I realized Ugong Cave adventures aren’t part of our budget but was somehow compulsorily sold to us. Because if we didn’t go and see the cave at Php200/head and went down from it through a sitting-position zip line (Php250/head), we won’t have anything to do until lunch time. Zip line souvenir pictures were available at Php100/shot. I’m just so not in the mood to go through the cave or stairs again. 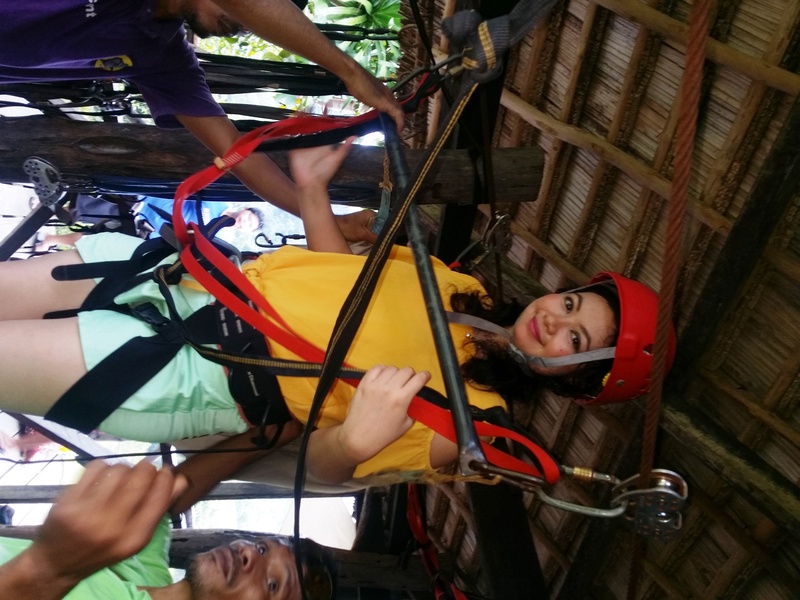 We chose the easy way and rode a zip line going down. Gearing for the zip line ride. The van was waiting for us on the other line of the zip line. Afterwards, we headed straight to the beach where buffet lunch was served. Filipino foods like rice, pansit, menudo, pinakbet, adobo, sinigang na isda and banana chips for desert were waiting for us. Drinks provided were softdrinks and tap water. Shortly after our lunch, we were called to ride the boats which transferred us to Mt. St. Paul. We were on that small boat for around 20 minutes. Just some more meters of hiking from the beach, we finally reached UR. UR is the longest navigable in the world spanning more than 8km but only 1.5 is accessible to tourists. Another boat is needed to navigate it to the end. Six people were allowed per boat plus the boat man who paddled for the tourists and was positioned on the rear of the boat. The same boatman also served as the tour guide. 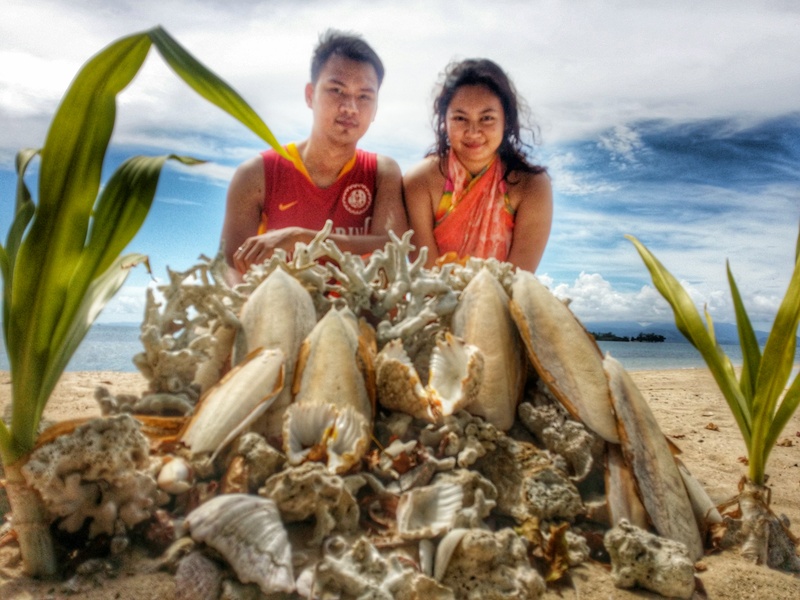 Like most people in Palawan who are linked to tourism, he speaks fluent English and knows how to throw jokes, too. I couldn’t stop from laughing when our boat man hummed “My Heart Will Go On” after he showed us a rock formation resembling a part of Titanic. One lucky person in the front of the boat will be responsible in holding the spot light and focusing it on the desired rock formation inside the cave -as directed by the boat man. As a reminder, it’s impossible to see anything inside UR without flashlight. We are strictly reminded not to touch the stones since they are “alive” or are still forming up to now. To preserve the cave, which forms stalactites and stalagmites at about 1mm only per year, touching them is strictly prohibited. Time and time again, we were reminded that this wonder of nature took millions of years to form. Any unnecessary human intervention may prevent the cave into forming to what it is naturally intended. The river is at 8 feet deep from the entrance and gets shallower as we progressed to the 1.5km spot. Water is brackish (mixture of saltwater and freshwater) therefore not a habitat for crocodiles. That settled my unfounded fear for this cave.We traversed the same path going out but this time the focus was on the rock formations on the other side of the cave. It took just 45 minutes to complete the tour. Souvenir photos were taken and sold by the staff employed by the city government. Restroom facilities are also maintained here. Filipino snacks and souvenirs are available back on the beach where we had lunch. At around 3:30PM we were on our way back to the city. Our new-found friends decided to bond some more in KaLui for dinner. Yes, we did reservation for 6PM. They open at 6PM – reservations are at 6PM and 8PM. Check out the ambiance of KaLui as this is one of the reasons why the KaLui is popular. They serve good food, too. We spent another night in Alta City Pension. Official receipt of Php6,500 payment that I handed to Ate Roxanne for one night stay in Dos Palmas Island Resort & Spa was given to me by the receptionist. It’s really cheaper, in this case, to just book when you’re in Palawan already. Published rates online are still more expensive even they say it’s discounted. Too bad not every day can be like this. What I’m most happy about is that we were allowed late check out the following day at 3:30PM. We were scheduled to board the last trip from the island to the wharf at 4:15PM. Below are the schedule of boat transfers to and from the island. We were welcomed by drinks and a group of people playing drums. The remains of a palm tree that was once one of “Dos Palmas” serves as a stand of the drums used in welcoming guests. A few minutes worth of orientation was given before we were escorted to our assigned beach villa. There are four rooms per beach villa. We were assigned on the second floor. I liked it. I just expected some beach view when I opened this door but instead we were overlooking the mangroves. 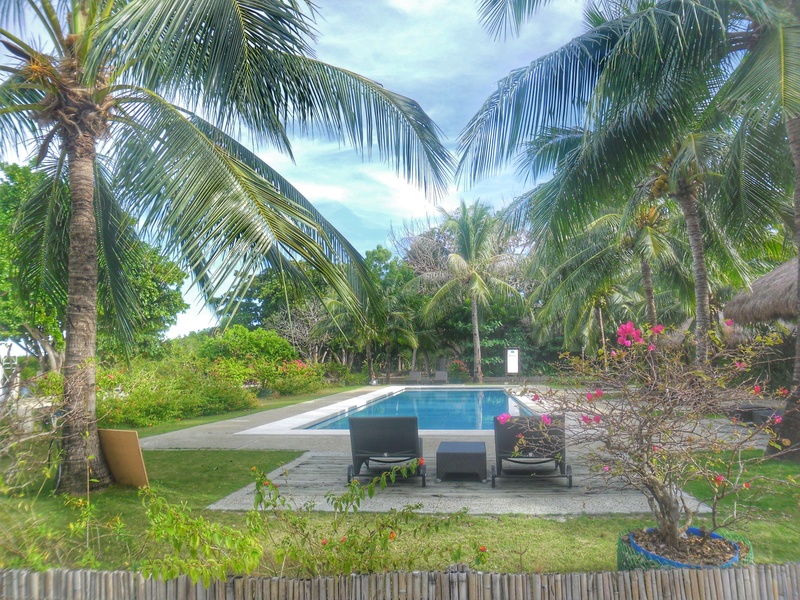 I think the executive villas nearer the beach and the pool which are priced differently have the view I was looking for. Nevertheless, I’m happy with the amenities inside our room. It just doesn’t have tv. During the orientation, we were advised to forget our busy life in the city. I think this was what they mean by that. Wifi was also only available in the restaurant. Power black outs are also implemented twice daily at 10-11AM and at 4-5PM. It’s also my first time to ride a real bike for I think, four years. Since four years ago, the only bikes I rode are the ones inside a gym. I know Patrick has been eyeing to buy a bike of his own, too, so we had a pretty cool experience using the bikes provided by the resort to explore the island. The bikes are very useful when getting to and from the beach villas. Instead of shuttle services used in other exclusive resorts like in Pico de Loro, Dos Palmas provides bikes for guests which are free for use but on a first come first served basis. You cannot reserve the bike-just as long as nobody’s using it or no items are intentionally left on the bikes to show that bikes would be used again shortly, you may use them. Bike seemed to be the most practical means of transportation in Dos Palmas. Through the bikes, we left no stone unturned in Dos Palmas. We stopped only on prohibited areas. The island’s navigable land surface area isn’t that vast. We passed the little farm where the restaurant gets its own supply of fresh and organic herbs and vegetables. We also checked out the basketball court being used by some of the hotel staff after their work hours. We also noticed some parts of the island where they are still cultivating ornamental plants and shrubs being grown around metal mesh patterns. To be used in the future perhaps. In fact, Beach 1 has contractors digging the area for further renovation/expansion. I have no doubt Dos Palmas will be more alluring when we come back maybe in a year or two. I’m glad we took the chance to try Paranarian Spa because this side of the Island offers more amenities like pools, beach and charming couches. (I need to stop myself from marketing this resort and spa since I’m not being paid to do this but I just love the place and the customer service that goes with it.) The best! So far. The thing with traveling and discovering wonderful places is that it will leave you wanting for more. Truly, there are so much more to explore. It’s more fun in the Philippines. We didn’t realize kayaking can be so fun, we did this twice. Good thing all the activities are unlimited. All life vests and snorkeling equipments can be obtained in the Marine Sports Center. For the snorkeling, a speed boat which carried only the two of us transported us to the snorkeling spot. I like the feeling of exclusivity, haha. And the feeling of getting things done at my disposal. There were very few people in this island. At any given point we were there, there weren’t more than ten people on any part – even during meal times in the restaurant. Clearly, if you love “Boracay vibe”, this is not the place to be. The customer service is superb – mainly because you don’t get the treatment like this even where they should be present. The waiters really wait for you. They don’t just implement hard rules without consideration for their guests’ convenience. Most importantly, when they know they are responsible for some mishaps, they will not only apologize, they will do something about it. Case in point, we cannot use the toilet during black out times because of water pressure insufficiency. They sent pail of water to our room just so we can use the restroom. And a lot of other little, petty things that really make the difference. I felt like there’s nothing you can ask them that they won’t grant. Every staff greets and smiles at you once they’ve seen you. It requires real effort and coordination as a team to provide a good customer experience. 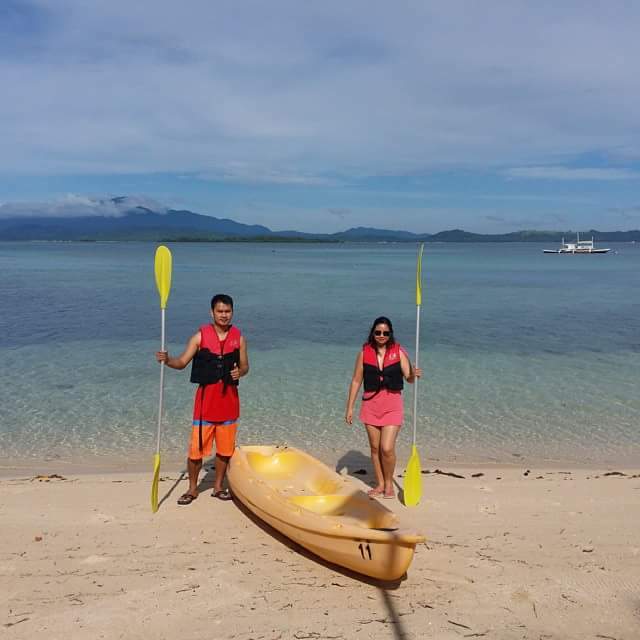 On our second day, an island tour in Isla Puting Buhangin was included in our itinerary. It is inclusive on what was paid for a night stay. This island has a sandbar! It wasn’t very low tide that time so the whole stretch of snake-shaped white sandbar wasn’t fully exposed but it still provided sandbar! I like! This got me excited even before really hopping out of the boat. Is the water here deep? To give you a clue, after the end of the sandbar, you can already see rich coral formations fit for snorkeling. There is a guide assigned here but if you want to snorkel on your own feel free. The guide is there mostly so that someone can take underwater pictures of you. Like! We were back on Dos Palmas to take a quick bath and lunch. After that, Weak and I had 60-minute Swedish massage inside a quaint room in Paranarian Spa overlooking the beach. The menu of services is surprisingly affordable. If we had more time I could have tried more of their services. Exactly 3:30PM we checked out. I hate leaving this place. But yeah, ’till next time. After checking in at Royal Crown Hotel (Php950/night), we checked out the local stores to buy pasalubong. Lamayo and cashew nuts, the most popular pasalubongs, are at Php250/kg and Php360/kg respectively. Personalized souvenir shirts are at Php250/piece. There are also a lot of food items at three pieces for Php100 and keychains and ref magnets at below Php20. Dinner was at a floating restaurant. We had quick breakfast at Chowking. We were craving for its wanton mami and lomi. Right on the dot as agreed, Kuya Dong fetched us after breakfast to the airport. Kuya Dong and Ate Roxanne are trustworthy, reliable and honest. If you need a guide to Puerto Princesa, you may reach them at 09053522461. Let’s all help boost local tourism!